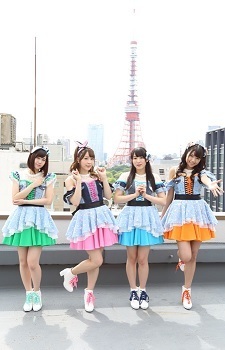 Anime "Katte ni" Ouen Project (アニメ"勝手に"応援プロジェクト), abbreviated as AOP (A応P), is an idol group produced by Nikkei Entertainment! which was introduced at Tokyo Game Show 2012. They recommend anime and talk about its appeal points through TV, radio, magazines, events, and the Internet. Their debut single "Never Say Never/Ari no Mama MY WAY (Never Say Never / アリノママMY WAY)" was released on April 5, 2013. Rin Kojima (previously AOP Zero) will take break starting September to study for exam. AOP ZERO has officially joined as AOP members. Osomatsu-san 2 OP "Kunshi Ayauku mo Chikou yore (君氏危うくも近うよれ)" AOP Zero members will also participate in performing.